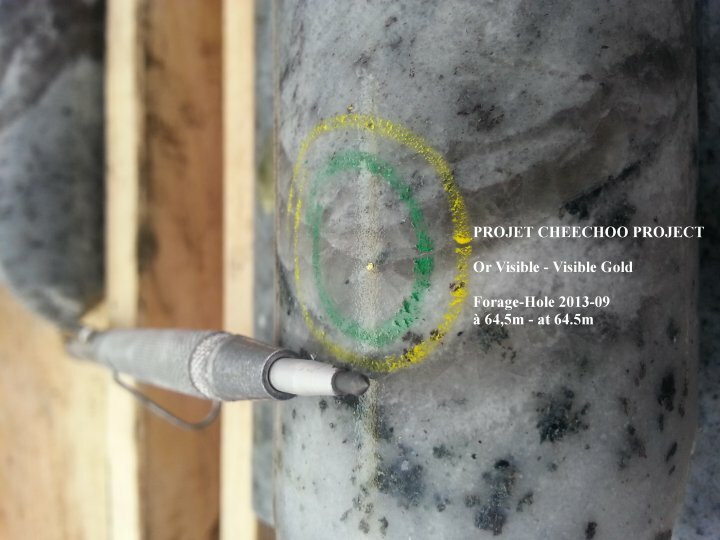 MONTREAL, QUEBEC--(Marketwired - Oct. 15, 2013) - The directors of SIRIOS RESOURCES INC. (TSX VENTURE:SOI) are pleased to report that visible gold has been observed in the first drill hole (#2013-09) of the current drilling campaign in progress on the gold Cheechoo project, James Bay, Opinaca area, Quebec. Ten gold specks have been located between depths of 63.4 m and 65.4 m. The 2013-09 drill hole is located in the west extent of the gold zone intersected in hole #03 drilled in 2012 (Ref. to the press release of February 12, 2013). As of today, it has reached a length of 123 meters and is made up entirely of silicified tonalite (intrusive rock) mineralized with very low amount of sulfides (arsenopyrite, pyrrhotite and pyrite). Consequently, it increases the known size of the silicified and mineralized tonalitic body westward. Hole 2013-09 is being drilled westward (azimuth 270°) with a dip of 45 °. It is located at Nad 83 UTM coordinates 18U 438352E 5830229N. A camp has been established on the Cheechoo property as well as the trail that allows land access for the machinery onto the drilling sites. This trail is linked to the road leading to the Goldcorp Eleonore gold mine currently under construction. Sirios presently holds 45% interest in the Cheechoo project and is in the process of acquiring the remaining 55% held by Golden Valley Mines Ltd (TSX VENTURE:GZZ), as described in the 9 April, 2013 and 19 June, 2013 press releases. This press release was prepared by Dominique Doucet, P. Eng., President of Sirios, Qualified Person pursuant to National Instrument 43-101.